Yesterday was our first day back in the woods with Chris and Ashirah Knapp, just in time to share in the gifts that the Earth offers in spring. The April program is taking place at nearby Broadturn Farm (where we have our CSA for the summer--yay!) which is also part of a land trust. This first program was about "Fire Making and Pre-Columbian Maple Sap Boiling". Chris and his charming son, Owen first showed everyone how to clear a space in the woods for a fire, how to find dry wood and tinder and how to construct a fire that would burn well. 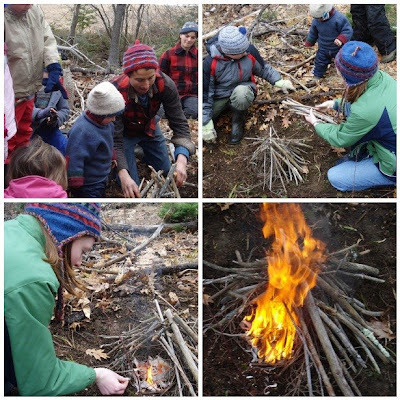 Next, we formed into groups with a mix of parents and kids and we then constructed our fires the way Chris had showed us. I know Olivia and Adam really enjoyed building their fires and maintaining them so they would burn properly. It was nice to be able to eat our lunches around our fires, since the sun never really never did come out to shine. 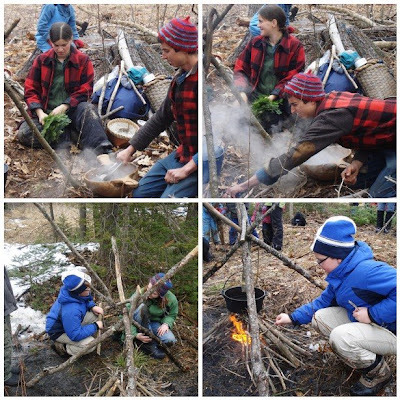 When it was time to move on to the next lesson, the kids had to first put out the fires and since it's early spring, there is still some snow on the ground, especially in the woods, so the kids used the snow to extinguish their fires. 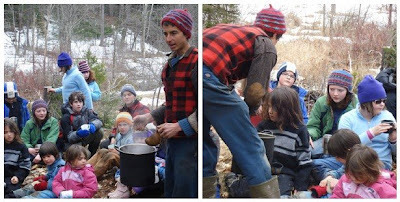 Soon after, Chris and Ashirah had us gather around for a lesson on tripod building, which we would use to hang our pots over the second fires the kids would build, for maple sap boiling. 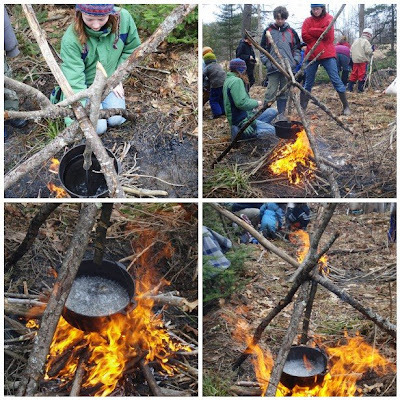 Before we began gathering our timbers and fire materials, Chris and Ashirah showed us how to heat rocks to place in birch bark baskets or burn-out bowls filled with sap. Just two very hot stones were enough to get the sap to a boil. Without time to make these two types of containers for ourselves in one afternoon, the rest of us would simply boil the sap in pots hanging from the tripods. It was amazing to see just how well the stand worked and how quickly our sap boiled, also. After our sap boiled, we gathered again around the larger fire, eagerly, while Chris went about pouring hot syrup into our mugs. There were a few ashes, a little bark and lots of goodness, in those cups of ours. It all went down pretty smoothly and it was delicious. We sang our songs, packed up, said our goodbyes and took our weary but content selves, muddy boots and wood smoke scented coats up the hill and to our cars. We'll meet again in two weeks, this time for "Buckskin Pouch Day". Awe... I would give anything for Noah and I to join you guys on these awesome programs. I loved that "woodsmoke scented coats" there's nothing better! Anet--I know, I always think you two and know that you would love being there with us. Erin--it really was. Thanks, both! Funny you mentioned our "scented" selves afterward... I stopped in at the library on the way home and as I awaited my pile of requests, the librarian shyly asked whether I'd been outdoors? near a woodfire? I started to apologize but she quickly responded that it smelled so good!